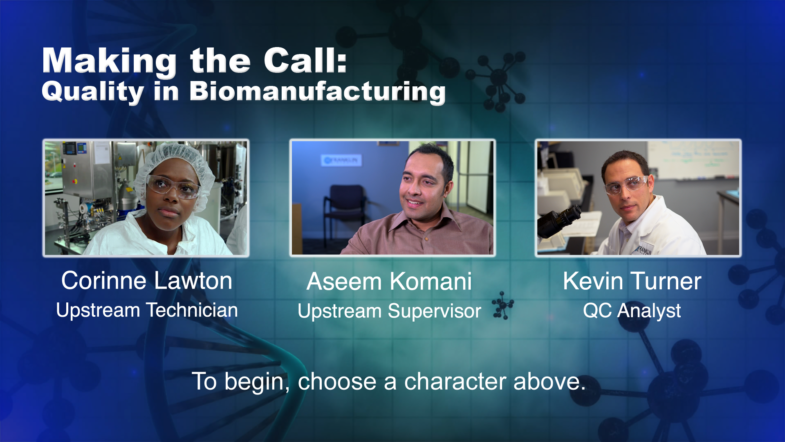 “Making the Call: Quality in Biomanufacturing,” is an interactive educational tool designed to teach viewers what it’s really like to work in the highly-regulated world of biomanufacturing. Through a series of video vignettes, you can step into the shoes of three different employees at a fictional manufacturer, and follow your character through his or her work routine. Along the way, you’ll make make real-world choices on the job, and immediately see the consequences of each decision. Your success or failure as a technician changes depending on the path you choose—providing an up-close sense of what it’s like to be on the front lines at a biotech firm. This series was created for the National Science Foundation, and is aimed at students and young technicians at the start of their career. As series producer, I created each story line and scenario, crafted the interactive framework, wrote the 275-page script, and worked with expert consultants to fine-tune it for accuracy. You can see the entire interactive (and view supplemental material) at the link below. This series was created for the National Science Foundation, and is aimed at students and young technicians at the start of their career. View the video interactive here.